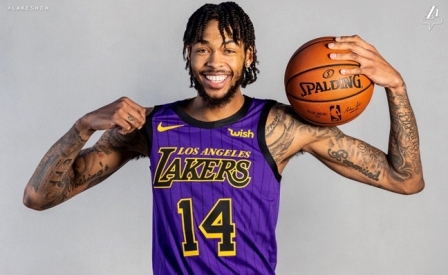 The Los Angeles Lakers will wear the 2018-19 version of their City edition uniforms for the first time tonight when they play host to the Portland Trail Blazers at Staples Center. Johnson’s autograph is featured above the jersey’s jock tag next to the words “Lore Series.” The shorts feature pinstripes that read, “3x5xSHOWTIME,” to represent the five championships Johnson won with the Lakers, his three MVP awards and the up-tempo offense he orchestrated. Johnson’s No. 32 and an M is on the waistband of the shorts. Each NBA team has four sets of jerseys. The City edition incorporates features of a team’s city into the jersey's design.